So I'm joining the party a little late, but I figure it's better late than never! I committed to try NaBloPoMo this month on the encouragement of Kathy from Bereaved and Blessed, and then I went and spent the past five days at family reunions. Hopefully you'll all forgive me, and I'll do penance at the end! It was always the same, comfortably predictable. Early in the morning, my father would put out six folding chairs on the side of the lawn under our large, shady oak tree (four for us, and two for any friends who happened by and wanted to join us), to stake our claim for a view of the parade. As a kid, I thought that parade was the bees' knees, and I loved the fact that it passed our house, that we didn't even have to truck all of the chairs with us, like everyone else did, even if we did have to tolerate strangers putting holes in our lawn. Honestly, I don't think we even had a marching band, but it didn't matter: there were police cars and fire trucks and what seemed like a billion boys in baseball uniforms and a guy dressed up as Uncle Sam who walked on stilts ... and at the end, there were Shriners wearing maroon fez hats, driving tiny carts around in figure 8s. By 10:30 it was steamy outside, and after the parade we would retreat to the air conditioned comfort of our house until my mother called us for barbecue: chicken, and sausages, tomato salad, potato salad, green salad, and ice cream. We would lobby to go to the fair, which was held down the street at Memorial Park: my mother never wanted to go, but I loved the veterans selling sausage and pepper sandwiches, vendors with cheap plastic trinkets and balloons, a few games of chance, dancers and karate students doing demonstrations on the small concrete stage. And best of all, there was a shuttle bus, a yellow school bus that stopped opposite our house that would whisk us away to the fairgrounds. By 5:30, we'd pile in the car with blankets and picnic sandwiches and leftovers from lunch, and drive to West New York, where we'd stand on the Palisades, shoulder to shoulder with hundreds of Latinos, where my father felt at home, and where, if we were lucky, we'd catch a glimpse of the Macy's fireworks. Now, the Fourth of July celebrations I love best are the ones at the Cape, where my husband's stepmother's family rents two cottages every year. I've watched the kids on that side of the family grow up over the past ten years, and I love the fact that they still enjoy the same Fourth of July traditions that they did when they were little, despite the fact that many of them are now in high school and college. There is a picnic breakfast of bagels and juice surfside by the ocean, sand-castle-building and hermit-crab-finding in tidepools on the bay side, swimming in the ponds at the nearby campground, toenail painting, biking on the rail trail. There is ice cream at Cobie's, beef barbecue, and great quantities of gorp. There are remarkable frozen brownies. There are quiet moments of book-reading, and raucous card games. There are no parades, or fireworks (except the ones on the beach), or fairs, but there is family. It's not even really my family, technically, but they've made me feel as welcome as one of their own. And it feels like the best kind of freedom there is. 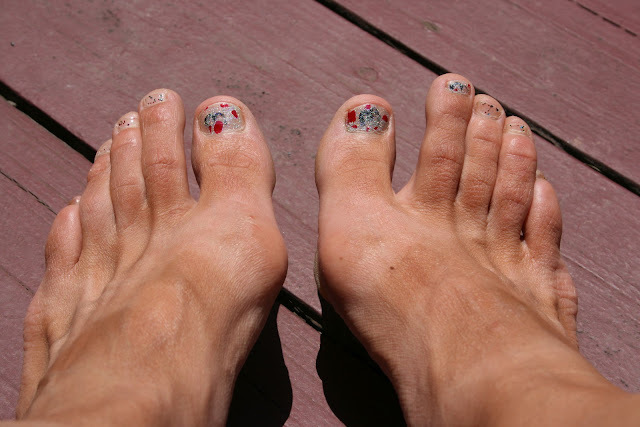 Though I'm sorry to be back, I can't help but smile when I look down at my toenails, which, this year, were painted courtesy of my five year old son. Here's hoping your celebration was as star-spangled as they are. 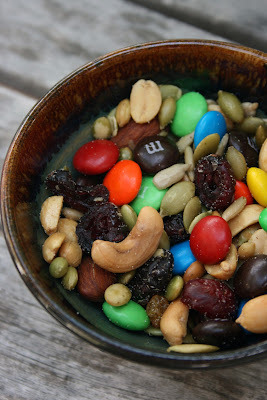 Mix together to your desired taste: sweet, salty, nutty, crunchy, chewy, or all of the above. What are your favorite Fourth of July memories? Those sound like lovely memories. I spent some time one summer at the Cape with my SIL at her ILs rental. It was delightful. Until this year, we have watched fireworks with my parents and my kids, my sister and her family. But this year? Too dry. Our town cancelled the show :-(. But we still got in our BBQ. Welcome back! Great post and so glad you are in for NaBloPoMo this month! You Then and Now memories both sound wonderful and I appreciate why both are meaningful to you. I still intend to do a 4th of July memory post, even though I missed the day it was the prompt and did and easier post that I didn't have to think as much about. But like you I have memories of going to (and eventually marching in/building floats for) our local parade, BBQing and watching fireworks (sometimes even on the 3rd and 4th). Also, like you, traditions have changed since since my husband and I got together 16 years ago and now we alternate where we celebrate. On the years we spend time w/ my husband's family, as you shared, it doesn't look and feel like it did when I was younger, but we still have a wonderful time being with loved ones and doing the things that my husband and his family did when they were growing up. Love the toes! They're quite a bit neater than my two year old's works of art that she loves to paint on mine, but I'm sure she'll be that good in three years. We love having holiday traditions, and yours sound like so much fun! We go watch a local fireworks display every year that's right down the road from us. Am jealous that you had a parade that went right by your house. Your descriptions of 4ths past and present made me smile. Your toenails are beautiful! :) Any event with lots of gorp is a good one in my book. My family didn't do anything special for the 4th, but my husband and I are creating some traditions of our own. We got together yesterday with friends and grilled out. Very laid-back, very fun. Your son did a great job on your toes! Your 4th memories are a lot like mine except add about 30 more people to the bbq LOL!